When you hear B3 and you are reaching to mark your bingo card you are a Bingo Lover. 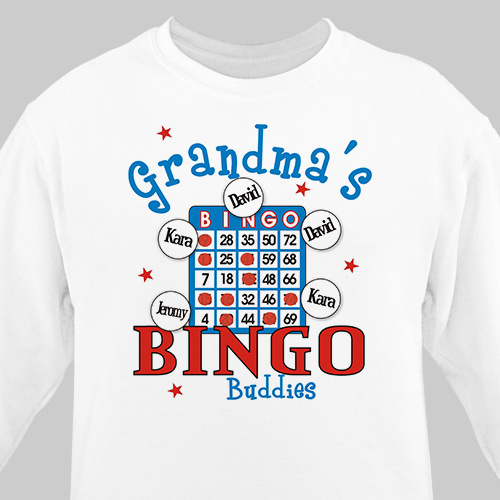 Whether its Grandma, Mom, Grandpa or Dad make sure they bring along their most precious good luck charms with this one-of-a-kind Bingo Personalized Sweatshirts. A great gift for an upcoming birthday, Mother's Day, Father's Day or special Anniversary. Our Bingo Lover Customizable Sweatshirts are available on our premium white cotton/poly blend Personalized Sweatshirt, machine washable in adult sizes S-3XL. Also available in Ash Gray or Pink. Includes FREE Personalization! Personalize your Bingo Sweatshirt with any title and up to 30 names. Sweatshirt was good quality. My mom loves to brag about her grandkids. I hope she wins at bingo when she wears this shirt. I previously bought her the matching bag.